The official title for Hobbs and Shaw is now Fast & Furious Presents: Hobbs & Shaw. The long-awaited spin-off finally started filming this year and Dwayne Johnson along with Jason Statham have been saying how great the movie is while also teasing fans with action-packed shots from the set. While the new title is a bit long, the studio more than likely does not want anybody to forget that this is a part of the Fast and Furious franchise when it hits theaters around the world. The Fast and Furious franchise is gigantic and the last installment, Fate of the Furious brought in $1.2 billion globally. It will be interesting to see how Hobbs and Shaw measures up to the franchise as a whole. Fans have been waiting a long time to see Jason Statham and Dwayne Johnson in the spin-off, so it could end up doing some pretty good box office business when all is said and done. Obviously, having Johnson in the movie will guarantee that a lot of people will go to the theaters to check it out. In a recent interview, Jason Statham talked about how much fun that he has been having on the set. "It's definitely become much funnier than we intended for it to be, I think," says Statham. The humor aspect makes sense because he and Dwayne Johnson have showcased little bits of that in the Fast and Furious franchise in the past. However, it sounds like Hobbs and Shaw is on a whole other level Statham explains. "The whole thing has been such a laugh. There's so many great elements to this that has made it become what it has. The director I've known for years from the days that I was trying to get into movies. And Dwayne and I never seem to get up to full speed when we're doing the Fast movies. We get little tastes of some of the fun that we can generate together. Now we really get to take all the brakes off and go to town with it." Jason Statham also talked about how excited he was to finally be working with Idris Elba. The actor says, "This has been a long time coming," and that working with Elba is "tremendous." Dwayne Johnson echoes similar sentiments when he shared a picture of Elba's villain from Hobbs and Shaw on social media. Statham had this to say about working with Idris Elba. "With what they've created with this character, I don't think anyone else can put the boots on. He's just so formidable, so talented, and I've never seen a villain played to this kind of depth. He's just so electric in what he's delivering." 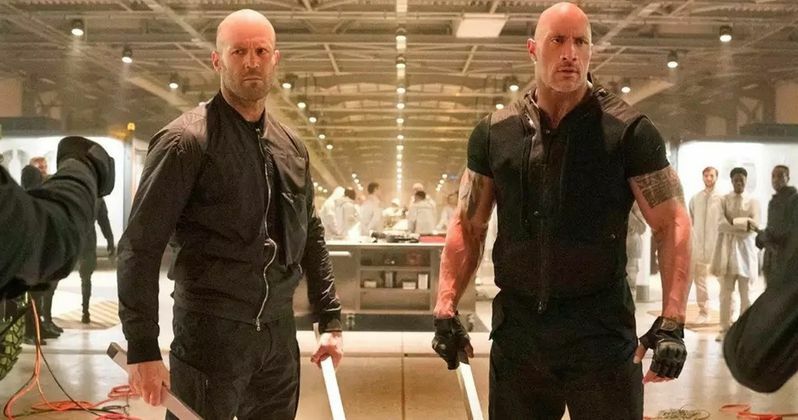 It sounds like Hobbs and Shaw is going to be a lot of fun, according to Jason Statham. He and Dwayne Johnson seem like they really get along and their both equally excited to bring Idris Elba into the Fast and Furious world. Now that we've been getting all of these teases from the set, a trailer should be on the way in the near future, ahead of the August 2nd, 2019 release date. The official title announcement was revealed by Total Film.